Wireless Home Automation Solutions are great for Rental Properties, Units and Townhouses or existing homes where the owner wants to minimise building impacts or does not want to spend a large amount retrofitting a fully wired Cbus infrastructure . The C-Bus Wireless product range incorporates a family of C-Bus Radio Frequency (RF) devices, including light switch Wall Plates, Battery operated 'freelocate' Wall switchplates, Plug Adaptors, Remote Control and a Gateway to Cat-5 Wired C-Bus units. 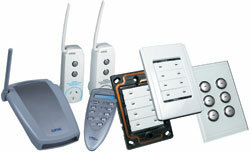 C-Bus Wireless Wall Plates are designed to easily replace standard, 240V wall switches.